When I run this, it first asks me to enter a choice. If I enter 'E' or 'R', it goes into the respective 'case' block but in the next iteration within the while loop, it doesn't wait for me to enter my choice. Instead it assumes I entered "NULL" and asks for my prompt third time. This keeps happening everytime I enter a choice. Here is the output of this program. What am I missing here? This happens because you type a letter and then you press enter. 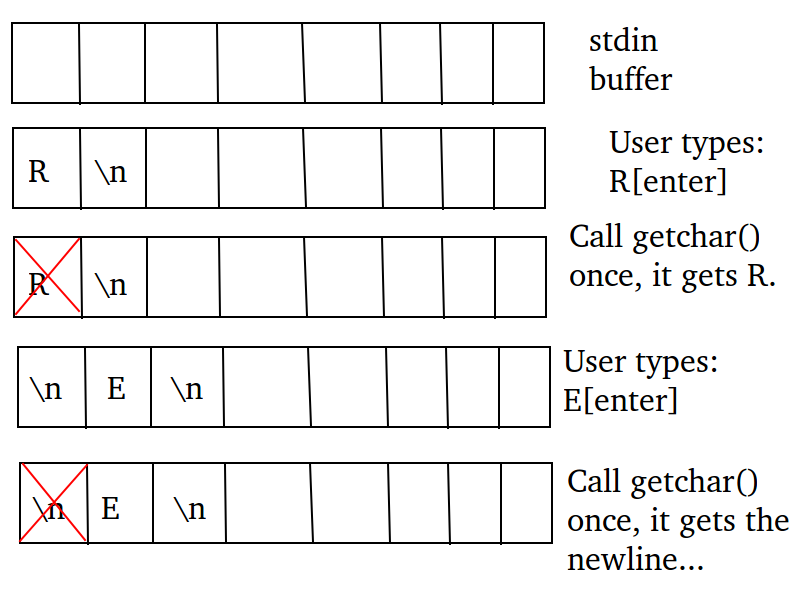 Use another getchar() to eat the trailing newline. So the solution is to eat the trailing newline! Another solution would be to use fgets(), see this question for more C - scanf() vs gets() vs fgets(). I had a similar issue to yours with scanf() and I was in your shoes, so I had written down the solution at the time. Not the answer you're looking for? Browse other questions tagged c loops while-loop io getchar or ask your own question.